body of work by Degas does not solely limit itself to the representation of dancers and bathers to whom the artist owes his notoriety. And although his canvases and pastels seem to reflect the work of impressionists, he has always endeavoured to maintain his independence through his use of movement. 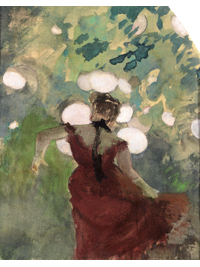 This exhibition presents Degas as he was: a transitional artist, oscillating between tradition and modernity, an heir to former masters, but able to innovate and translate his experiences. And so, this exhibition attempts to emphasise new perspectives on the work of the artist that we all thought we knew. The Lebanese tourism office in Paris celebrates it 50th anniversary and becomes the tourism office for all of Europe!